Overlap paper strips at wild angles, covering every inch of the sculpture frame. It is difficult to keep track of which areas are thinly covered and which areas are thick, but I'm going to give you the following guidelines anyway: If the internal structure is a balloon, or other temporary structure, you will need to use about four layers of paper to create a self-supporting exo-skeleton when this paper dries. If you have a rigid armature, such as chicken wire or soda bottles, you only need two layers. Use half-strips or smaller pieces in areas where long strips are ungainly, such as where the surface is made of sharp angles. Do not start the crossword puzzle as while you are gluing the strips down. Be sure to smooth the strips down with your hands. This isn't as important in the beginning, but it is very important for the top (final) layer. 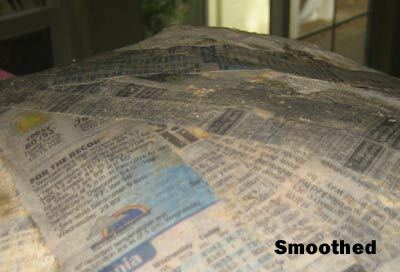 The wet strips of newspaper should be smooth and they should conform to the shape of whatever they are covering, just like a wet T-shirt. The edges of each strip should be stuck down. If the paper is popping up off of the surface, try smearing an extra couple of tablespoons of paste onto that part of the paper. Beginners can find it surprising that the sculpture is turning out to look exactly like the armature. That it doesn't hide flaws. They also may find it difficult to "build up" places in the sculpture (such as constructing a nose or ear) with wet paper. Maybe I should have mentioned this earlier. I find it very satisfying to apply the final strips. Check the entire surface for small holes between the strips, and try to keep the finished surface smooth. Larger projects need more than one session of paper-applying, because you won't want to work on the feet while the hat is still wet. When you are finished applying paper, clean up. Store the unused paste covered in the refrigerator, or just throw it out and make fresh stuff tomorrow. 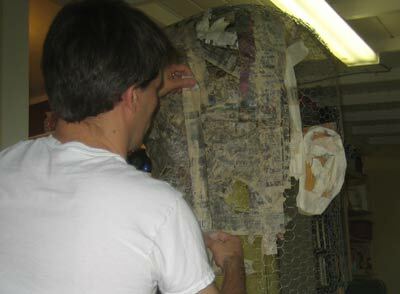 Depending on the temperature and paper thickness, it will take between three and thirteen hours for the paper to dry. 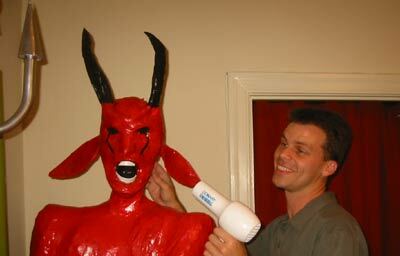 If your sculpture contains balloons, do not try to hasten the drying with direct sunlight or a heat gun. The heat can cause the balloons to expand, bursting out of their paper shells. Fans are OK. It is easy to see when the paper is dry. The color becomes much lighter. Behold! 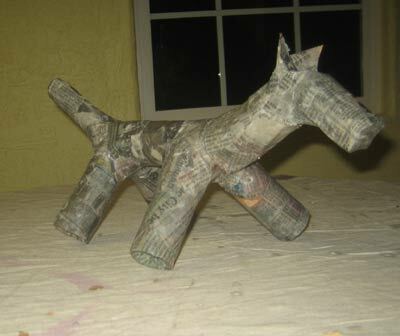 The paper mache sculpture is finished, ready to be finished with paint or crepe paper. 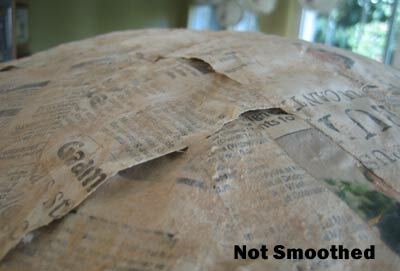 Before you start painting, take a critical look at your project and see if there are any defects in the skin. Paint can only fix pinholes. Any holes larger than that may actually be easier to see when painted. 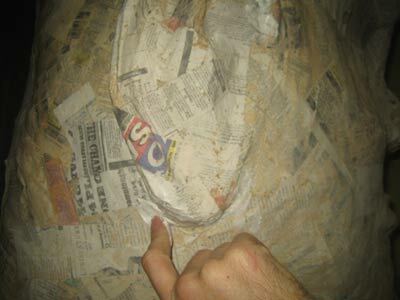 Holes can be covered with more paper mache strips or with spackle. 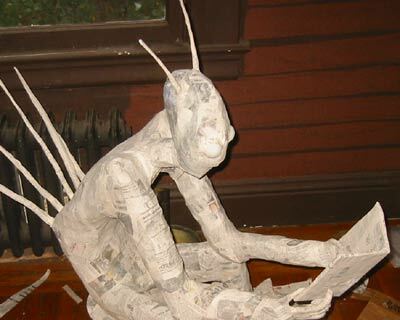 Every type of paint seems to work with paper mache. Latex house paint, craft paint, spray paint. 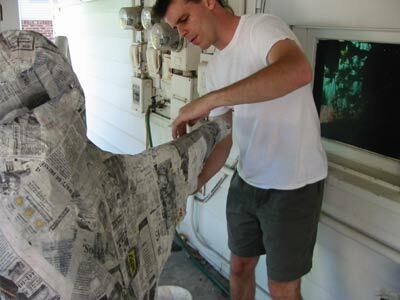 The only problem I can imagine arising is if the paint is so sloppy wet that it softens the paper mache. One coat of paint is usually enough. I'm no expert at painting, so I have almost always chosen color schemes which are plain and cartoonish. And that should do it! Now that you have read all of the above, you are more than ready to give it a try. Good luck, and don't forget to take photos while you are working, not just of the final result.